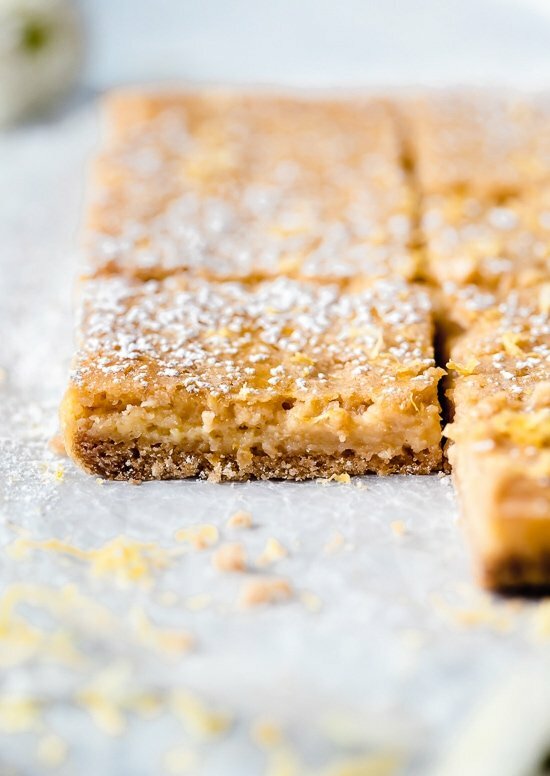 These lightened bars use far less butter and sugar than traditional lemon bars. 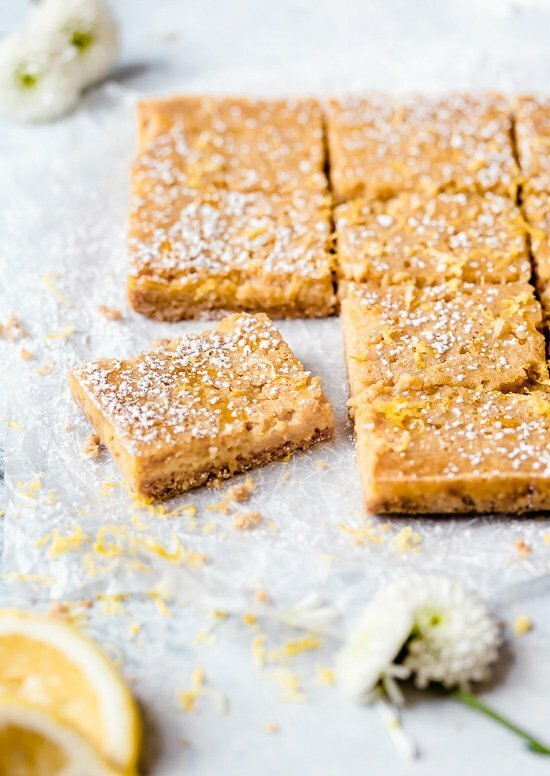 Honey is a natural way to sweeten these lemon bars but it also darkens the color of the bars compared to traditional lemon bars. But no worries, they taste so good you really won’t care. 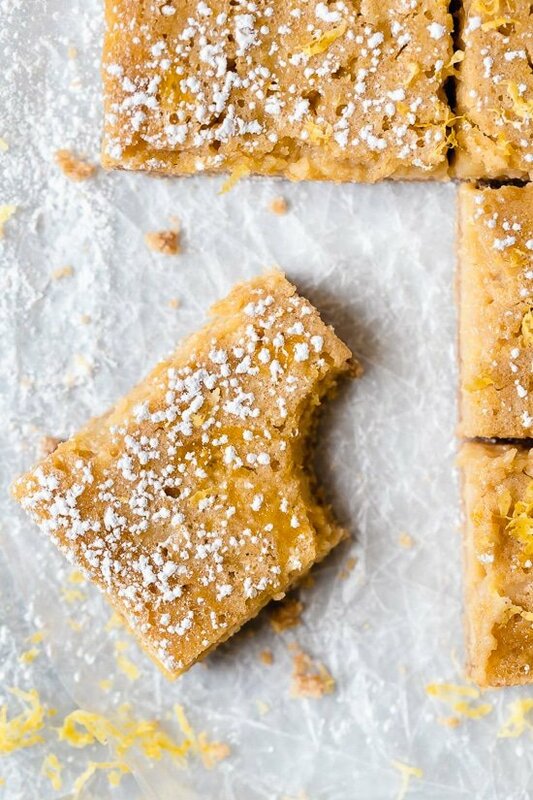 The only problem with these lemon bars is that I find myself making excuses to eat another, so I suggest making these only if you have some friends to share them with! I first posted these in 2012, and noticed some people had issues with the lemon topping running under the shortbread. So I tested them again a few times and perfected them. Use a glass or ceramic baking dish. I find using a glass or ceramic baking dish is best to avoid a metallic taste. Make a sling for easy removal. To easily remove the bars from the baking dish once ready, make a sling with parchment paper. Line the pan with the 2 long sheets of parchment paper placed perpendicular to each other in the pan. 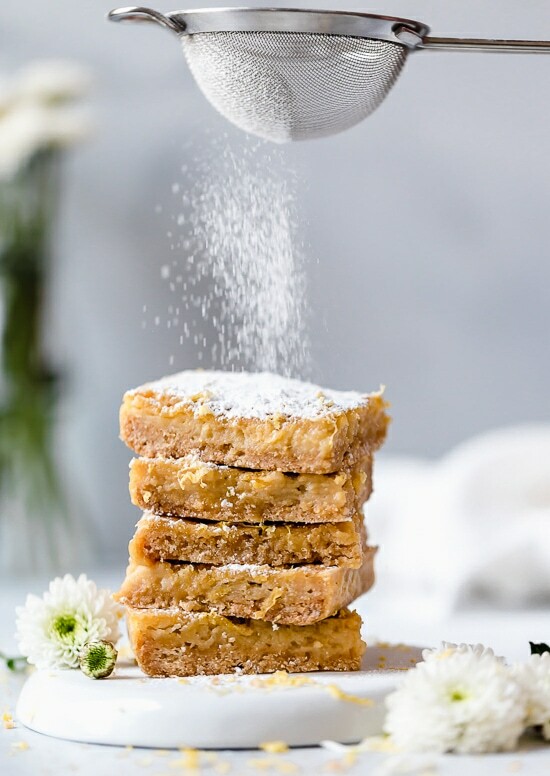 They should be long enough to hang over the sides to use as handles to lift out the baked lemon bars before cutting. When making the crust, make the sides higher to prevent spillage. Add the flour mixture to the baking dish pressing into an even layer and up the sides of the dish about 1/4-inch so the filling doesn’t spill out. Let the crust cool once baked before mixing the ingredients for the topping. 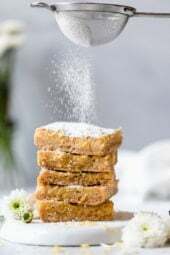 Don’t add the powdered sugar until ready to serve. Use a clean hot knife for cutting. Clean in between cuts. 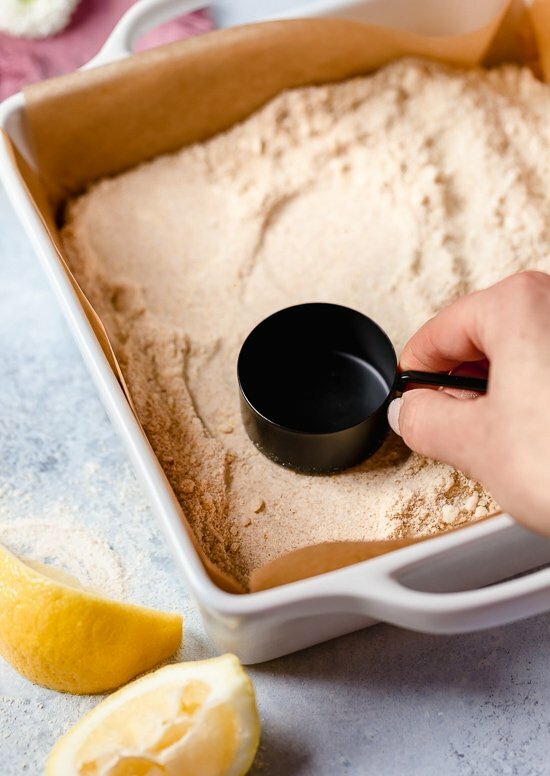 Prepare an 8-inch square glass or ceramic baking dish pan by lightly spraying the inside with baking spray. Make a sling: Cut 2 sheets of parchment paper 15 x 15 inches each. Fold them in half so they are 7 1/2 x 15 inches, which will make them sturdier. Line the pan with the 2 long sheets of parchment paper placed perpendicular to each other in the pan. This is so you can get the bars out after they are cooked, so don’t skip this step. 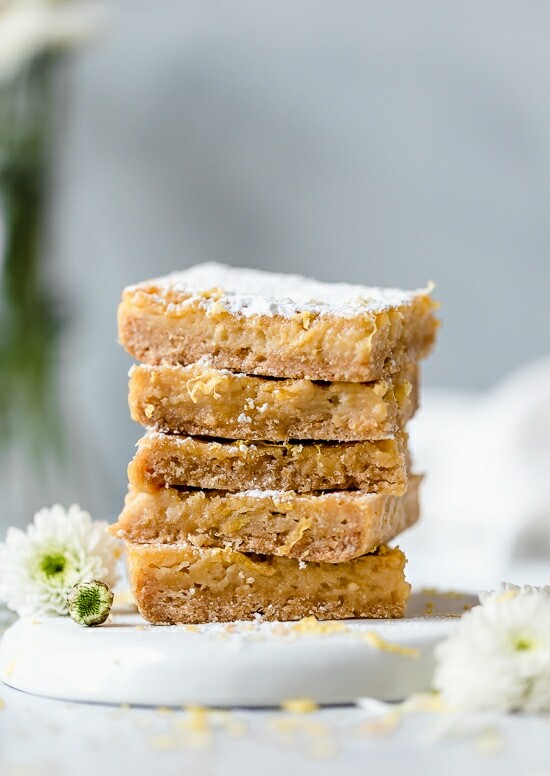 They should be long enough to hang over the sides to use as handles to lift out the baked lemon bars before cutting. Spray the inside of the parchment with baking spray. 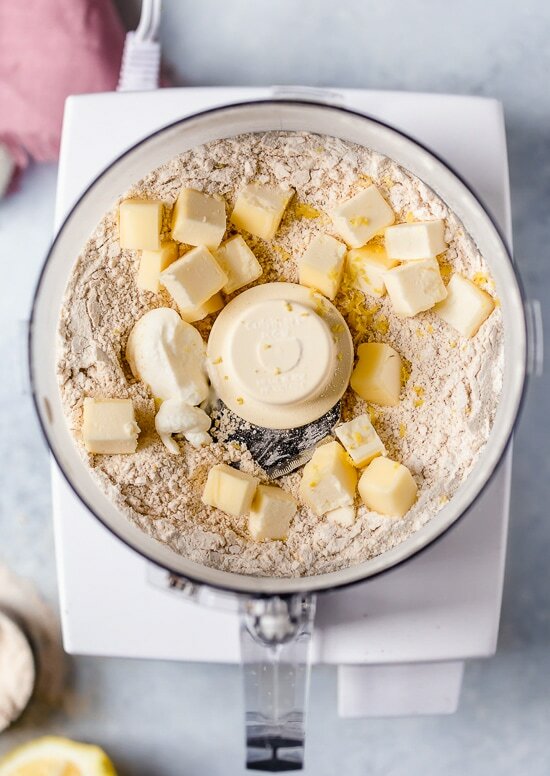 For the crust: In a food processor combine the flours, brown sugar, cornstarch, lemon zest, baking powder and salt and process until well combined. 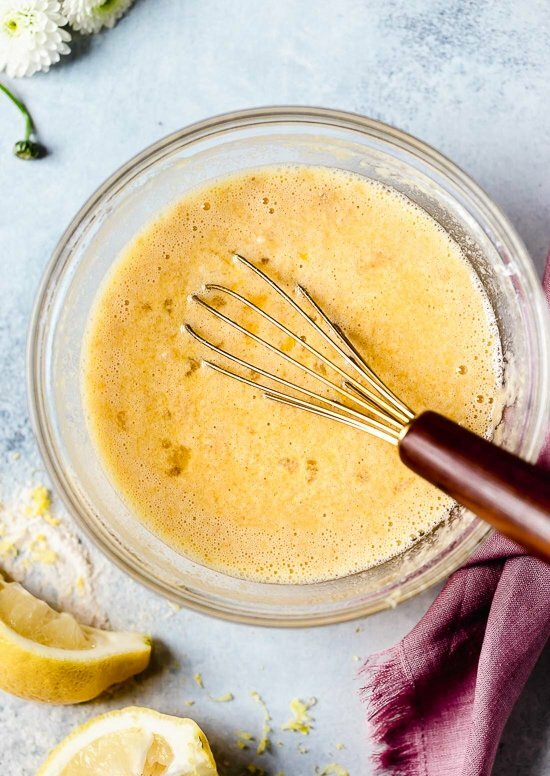 Add the butter and yogurt to the flour mixture at once and pulse at least a dozen times before turning out into the prepared pan and pressing into an even layer and up the sides of the dish about 1/4-inch so the filling doesn’t spill out. Bake until evenly browned about 30 minutes. Shut the oven off and cool the crust on a metal rack for at least 20 minutes. Once cooled, heat the oven to 325°F. Stir in the lemon juice and pour over the cooled crust. Bake until filling is set, about 22 to 25 minutes. Cool completely before lifting the bars out of the pan with the parchment. For best results, refrigerate overnight for a firmer topping. Cut into 12 squares using a clean hot knife, clean in between slices.